Much to my mother’s indignation, I owned very little clothing that was not covered in paint. From a very young age, I showed talent in art and music, but wanted to pursue a career in the sciences. I was told by several people that a career in science made more sense than trying to “make it” as an artist. At first I agreed, so I started my education at the University of Utah as a double major (Art and Chemistry). However, I never planned on finishing the BFA, I just took art classes to improve my skills and because I loved art. Eventually, I received a BS in Chemistry and finished with a Master’s degree in 2004. During graduate school, I had no time for art, which was a first in my life. I had taken it for granted. During graduate school is when I realized art was more than a hobby, it was a necessity and I wanted more art in my life than a career in science would allow. After graduation, I worked in a toxicology lab for about 4 years. However, after leaving my job to raise my first child in 2008, I had the opportunity to paint more consistently. Prioritizing painting and taking workshops from artists I admired paid off. Soon I was not only exhibiting and entering shows regularly, but also winning awards. Two of my passions in life, besides my family, are painting en plein air and watercolor. When I paint, I learn more about myself and how I see the world. I find beauty in everyday life, the so called “mundane”. Ordinary people going about their everyday lives inspire me. 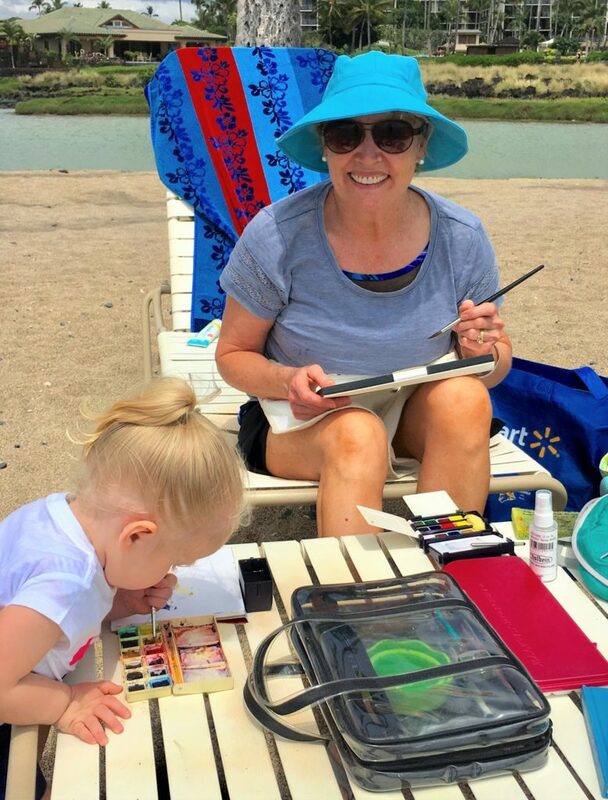 I especially enjoy painting en plein air, where each painting reminds me of where I was, of the experiences I had, the sounds, smells, and the people I met. My paintings are always more about a moment in time than about a particular location. 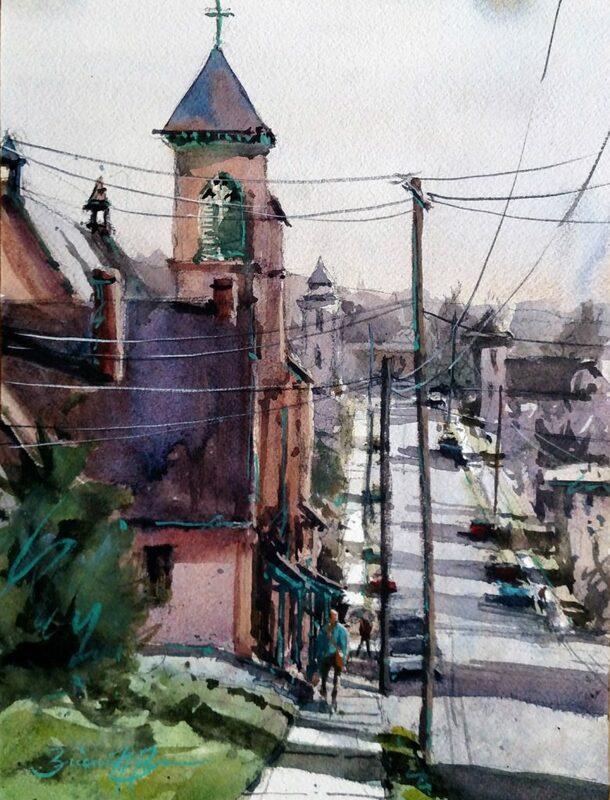 When I am painting on location, I love talking to local people who share stories and their love of the place they live. Creating these connections is important to me. I don’t get these experiences while painting in the studio. That is why most my paintings are plein air, or at least inspired from plein air sketches. My second passion is watercolor. I love the wonderful sense of freedom and slightly controlled chaos that watercolor provides. All of my paintings begin with choosing a subject, whether I am on location or painting from photographs. I look for interesting shapes, designs, and light patterns. After a small value sketch where I plan my composition, I lightly draw on my paper for a general guideline. As I apply paint, I look for inspiration in the scene, in the people I see, and in the paint on the paper. I start to look less and less at the scene in front of me and more at my evolving painting. This helps me to focus less on the details of my subject, and more on my impressions of where I am. My goals are to bring the everyday to life and paint my impressions of a place. As an artist, I enjoy sharing how I see the world. I saw you talk about this on FB and had to check in. Great location! We met at the PACE event. Great job! I enjoyed it. Thank you so much Margie. It was so fun. It was a great day! ? You make your own watercolor canvases? Neat. Another wonderful painting, Brienne. Fantastic work. Do you have an instagram site?